This year I’ve fallen in love with hemlocks. Didn’t think that much about them, don’t see them much, then I stumbled upon rows of them at Bachman’s Wholesale nursery in Farmington and thought, man, what’s the catch? Canadian Hemlock will grow to 70′ with a spread of 35′, so for smaller areas look at the weeping variety ‘Sargentii,’ which grows into a willowy, cavernous, 15′-high by 30′-wide tumbling waterfall of texture. The one I’ve been planting in people’s yards most often, however, is Tsuga canadensis ‘Monler’ (sometimes sold as ‘Emerald Fountain’), a more dense, formal, columnar variety that tops out at 10′ while retaining a 3′ width. Gorgeous, gorgeous plant, good around the foundation or out adding fun (and winter interest) to the perennial bed. I grimace when I think of the times I’ve sold a client a Holmstrup arborvitae, instead of ‘Monler.’ Ugh. Other varieties include the ground-hugging ‘Cole’s Prostrate,’ hovering only 2′ above ground while sprawling out 5′, and ‘Pendula,’ a weeping form maturing at 15′. All varieties do well in sun to part shade, but generally prefer less than full sun. ‘Monler’ handles full sun best. They prefer moist, well-drained soil with a pH between 5.5 to 6.5. In the north they are virtually disease-free, but are being plagued by attacks of the wooly adelgid on the East Coast. All respond well to shearing, though you would probably only shear ‘Monler,’ if for some reason you wanted it very dense and formal in appearance. 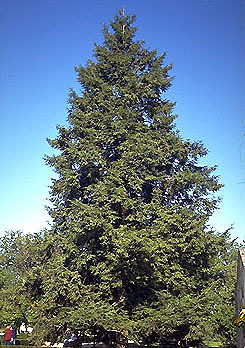 Place hemlocks where they can be seen up close. The undersides of the needles, quite often visible, feature two silver stripes. If landscaping along a fence, use ‘Pendula’ alone as a sculptural focal point. ‘Monler’ looks great solo but also makes a fine hedge. ‘Coles Prostrate’ is a great groundcover, preferring at least part shade, and looks great on slopes and near rocky ponds and streams. All varieties hardy to Zone 3.